Folks - This is WINTER tog fishing. A trip can go south fast. Tog DO NOT always bite! My crew MIGHT have white crabs, usually do. The boat provides green crabs. Reservation staff hardly know what species we're after, let alone whether there will be a certain kind of bait. Sea Bass Are Closed. I sincerely hope this will be the last year of that nonsense. 15,476 Reef Blocks deployed at numerous sites: Doug Ake's Reef 3,133 - St. Ann's 1,555 - Al Giles/OC RUST Reef 1,125 - Eagle Scout Reef 904 - Sue's Block Drop 184 - Nichols' Concrete 774 - Capt. Bob's Block Drop 156 - Benelli Reef 341 - Wolf & Daughters Reef 230 ..
One lonely sea whip survived Hurricane Sandy. 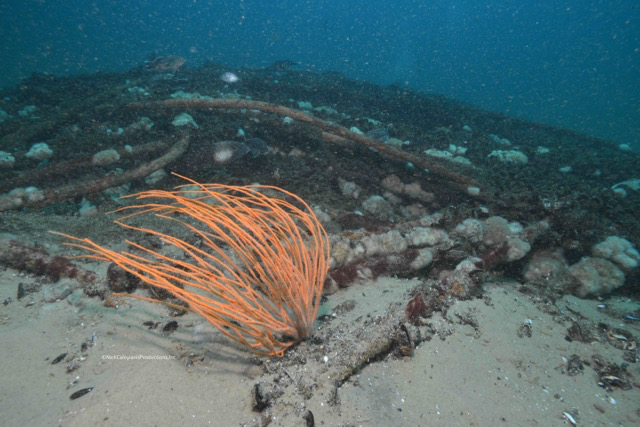 This cable reef in 40 feet of water had been covered in whips..
Our super-long trip Monday fizzled. Unless your name is CJ - he had two personal bests. Nice fish of 12 & 13 pounds. Really couldn't get the bite going. Tuesday, on a much shorter 8 hour trip, we had some limits and some good releases. Not a great bite, but worth baiting up for the patient. Coming weather looks remarkably different than so far this January. I've never put my crew on unemployment, but I was beginning to wonder! Have a big offshore blow early next week. Let that pipe down & try it some more..
Below is a letter I sent to upper management a few weeks ago. Determining what is real rather than simply a convenient excuse is crucial to our young endeavor. Believe me, we have not been restoring marine fisheries long enough to know what's best - or even what's true. "Oh, we sure did a great job with striped bass!" Did we? How are sea trout doing? Same ecosystem niche. One's a rockstar. The other? Lots & lots to learn.. There's a recent article in the NY Times that brings broader public light to warming-water's effect on fish abundance. http://www.nytimes.com/2016/12/30/science/fish-climate-change-northeast.html Some of you are quoted in it. Yes-Yes-Yes, warming is allowing populations of fish to spawn where there had previously been other populations of cooler water fish. However: "The center of the black sea bass population, for example, is now in New Jersey, hundreds of miles north of where it was in the 1990s, providing the basis for regulators to distribute shares of the catch to the Atlantic states." illustrates how poorly we grasp another concept mentioned in the article - Ecosystems Based Management. If we are to understand, & employ in some fashion, "ecosystems based fisheries management," then we should unpack that NY Times statement, remove it from the classic 'landings history' regulatory quota division, and look for incongruences in its logic as most would perceive. No, sea bass are still found, and in growing number, along the Florida panhandle & way down the west coast. They are also still abundant on the east coast of Florida as well & have been declared "Restored" by the SAFMC. My point: in Georgia there are sea bass fishermen, today, who rely on the species as I do. Ninety miles further north in their traditional Mid-Atlantic haunts--from Block Island now into Southern New England--isn't such a huge shift when the species' true range is explored. As I recall from my work, there are single wave/single state waves where recreational extraction is shown to be higher, by official estimate, than an entire year of even coast-wide commercial extraction. MRIP/MRFSS & the arbitrary "white line" of Cape Hatteras north as some vital dividing point where no southern sea bass should count; this poorly perceived picture, an alternate biological reality, is what is raising alarm. There's another really powerful force, if little recognized, that's at play in sea bass, at its very center -- YOU. Yes, regulators, & how science paints the picture everyone sees as a result of regulation, are incredibly powerful forces where man is the primary cause of mortality. Last year (May 2015) I had the single worst cbass spring run of my entire 37 years. Absolutely pathetic. Sub-bottom survey noise over several years had vacated a gigantic swath of prime sea bass habitat; the accumulated failings of size limit regulation forcing an increase in age at maturity - collapse. Then, this year, the very thing I have so begged your examination of -- this year we had a return of sub-9 inch sea bass to the male spawning class. Soon you'll relax the northern states cbass regs which were so important to creating this idea of a "HUGE SHIFT" ..exactly while our stock down south grows rapidly owing to a return of spawning production. What Then? A homogenous population between Cape Hatteras & Cape Cod won't fit the alarmist's painting.. I believe what your actually looking at is habitat production and a demonstration of regulation's power over finite habitat's output. My kingdom that you might begin to grapple it. Spawning site fidelity is extreme in sea bass. They're also really good at colonizing new habitat. When we build a huge new artificial reef - initial colonizers will have a lower age at maturity because there's no competition. Sea bass, as seems everywhere in biology, are driven to fill any 'open' habitat. In the lower orders, reproduction continues until collapse. In higher orders reproduction is shown to change in response to population and available resources---there is a perception of 'habitat capacity' in play. My argument for manipulating sea bass production has depended on tricking them, by the size of fish around them, into thinking there's still plenty of room and resources. . . .
1) Age at maturity can be controlled--More Is Better. Not bigger females. We had that for years & years. We've had bigger females since 2001 than scientists 40 years ago believed even existed. Nuthin. No spawning increase. But adding more spawners, via adding more & younger year classes? POW! A re-enlivenment of production. 2) Habitat, regardless whether it's been discovered, is brutally important. Sea bass are reef fish. A "reef" is essentially a rock or rocky area -or any simulation- where growth occurs. When sea bass find such a place they put up a high-def TV antennae and make it home. They flee cold water come late fall & return to that exact spot come spring -- to spawn. That's habitat production. It is spatially finite & can be managed - must be managed, especially where the most industrial gears are employed as stocks contract in winter. 3) We know stern towed gears damage hardbottom growths. Because there were more sea bass landed from 1950 to 1961 than in all the years since combined; and because I believe I witnessed habitat capacity, locally, in 2002/200---yet there is no possible way we were approaching the population that was harvested from post WWII; and because I paid close attention to tales of WHERE sea bass were caught before my time: I believe seafloor habitat loss a far greater problem than today's restorationists recognize. That water is warming is unquestionable, surface water especially. You should know, however, our SCUBA community still complains heartily about 50-some degree bottom temps in 120 feet of water. And, Yes, I was advertising Atlantic Cod just a few years ago for the first time off MD since the mid 1970s. You must soon change how allowable harvest is calculated. Because marine fisheries restorations are such a new endeavor, spanning only 30 some years; you'll have to invent how. The key is in understanding habitat production & habitat fidelity. Maximized spawning production/Minimized spawning production. Recognizing historic habitat's footprint and recreating it ..or holding the course we're on. When we can circle the three best ones as effects of management, the effect will be jaw-dropping.